Last week, ENE Systems (my summer 2016 co-op) invited me on one of their outings. The engineering and integration groups all went out for hibachi and a puzzle game. The invitation to meet up with the group was a real honor and the outing itself was a blast. 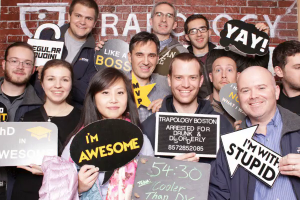 If you ever get the opportunity, Trapology in Boston is an awesome adventure for a group of engineers. Not all Wentworth students are engineers, but I think all of them would be entertained by the experience. Entrants are dropped in a room and have to escape by solving puzzles and finding clues in the room. As a player, I was able to use skills developed by my Wentworth education: leadership, communication, attention to detail, and looking at a problem with multiple perspectives.